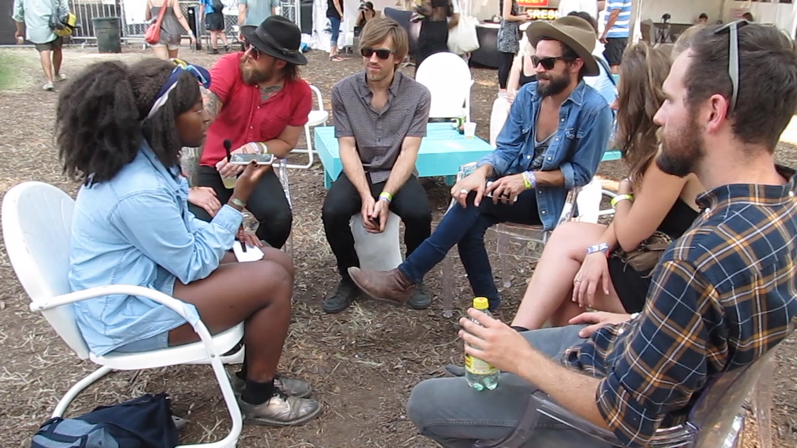 Austin’s own, Bee Caves hit the stage at this year’s Austin City Limits Festival. In 2014, they released an EP named Animals with Religion. Known for their shows around the Austin area and their song “Running Home to You,” we sat down with Bee Caves and got to know what we should expect from them in their upcoming ventures. How is your ACL experience going so far? R- Um, Pretty good. We played an early show today and it is hot, but I think it went pretty well and we are having fun. What is your favorite thing that you saw today? For example, the audience. Sam- We kind of been hanging out in the artist lounge, talking to people and hanging out with friends. I think later this evening all of us plan on seeing Unknown Mortal Orchestra. I think we are all pretty excited about that, that’s the plan. Coming from Austin, what does it mean to play at a festival like this? R: It’s a beautiful thing. We have a residency in town on South congress, so for us to do something really local and have the platform of ACL… we couldn’t ask for more. We are excited to be here and no matter where we are at, from a small bar to a festival, we are happy to be there. Do you perform the same way here as if it was a small bar in Austin? R: I like to think that even when we are by ourselves and rehearse, we still play the same. It’s not like we are playing music for other people, we our playing for each other as well. You recently came out with an album last year, are you going to come out with anything new soon? Or do you want to continue branching off from the last album? R: No, we retired. Just kidding. We actually have a ton of new material that we are excited about. Potentially, we will be cutting a record in the next six moths or so. R: Yeah, we were just talking last night about how we were hoping by the end of next year too have an album out. How different is it going to be? If you could describe Bee Cave’s music as a candy, what would it be and what would it taste like? R: Green Flavored sour patch kid. R: Sour and Sweet in the middle. Also, it’s not exactly what you expected. B: I am going to say Marshmallow, because it is smooth and tender and so good. I feel it. If you could listen to any artist for the rest of your life, who would it be and why? S: That’s a hard one. R: Why would you do that? That’s a terrible question. M: Nick Drake’s Five Leaves Left. S: Neil Young’s Harvest, that’s mine. R: I think collectively, we have this good desert island sort of record collection. B: For me it is going to be The Band. R: I refuse to answer the question but I will say why is it not OK Computer. Rob: Let me be me. So are we all agreeing on Drake? R: Yes, that’s the only person I know that is playing besides Unknown Mortal Orchestra. So would it be this experimental rap-rock group. R: Yeah it would be like late 90’s rap-rock. S: Steve Stevens would have to play guitar and Billy Idol too. He’ll just snarl. R: Yeah he’ll do the snarls and the dances. On the album it will be like Snarls: Billy Idol. Rob: That can be the name of the band, Snarls and Sweats.